Every single PC user has set of his favorite software. Even if he doesn’t know about that and selection ends with Solitaire. What if you take users in specific area, add up their tools and see what comes on top? tlbox is simple site that offers you to make online toolbox with selection of links to your favorite software and services. Top level sounds bit intimidating but there are plenty of sub-categories that are often closer to general-purpose than professional. Site can be used simply by visiting but to make your toolbox persistent you have to register. Same with adding new links. 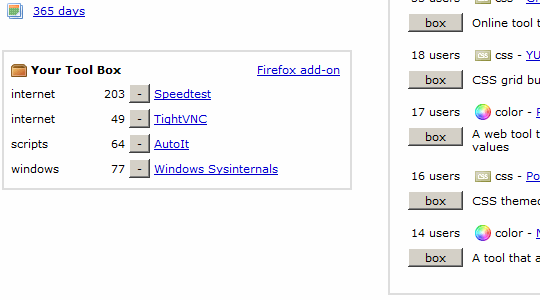 Aside from web there is also Firefox plugin available that gives quick access to the toolbox. Links in interface are sorted by number of users that have them in toolboxes. No voting, no cheating and no fluff – those tools that are used and loved rise to the top. Site is hardly mainstream and there are no huge crowds to improve statistics of selection. However honest and transparent ranking is bit of fresh air. tlbox is hardly social media monster but it is interesting niche online bookmarking solution. Even if you have no intention to use it – still worth browsing for good tools. Interesting. Something else to play with. Will download the add-on and see what this lot has to offer.